Black clouds burst from the sky and rain hammered down on Darwin all that morning. The trees were luminescent and the cool of the rain had washed away the hot night. By late morning the clouds and rain had been sucked back into higher altitudes to be replaced by stifling heat and blazing sun. I placed my daughter into my rickshaw and peddled off, sweat soaking my Jabiluka singlet in no time. By the time I got to Parliament House I was soaked. A mobile shelter had been set up, chairs aligned in a row as if a concert was about to begin, to provide shade. Most people were clustered around the edge of the car park where a cool breeze randomly offered relief from the heat and humidity. Close to one hundred people were gathered outside Parliament House in Darwin this April afternoon – traditional owners from Muckaty Station, activists from Alice Springs and Darwin, a woman who’d helped defeat the waste dump proposal in South Australia, unionists, two politicians and concerned citizens. 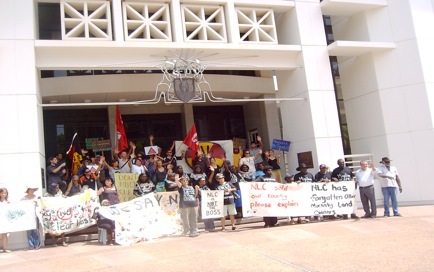 The reason for the gathering, aside from showing opposition to the nuclear waste dump at Muckaty Station, was the senate inquiry taking place inside Parliament House to investigate the process and viability of the waste dump. The senate inquiry really should have taken place at Tennant Creek, the nearest town to the proposed waste dump. The government claimed there hadn’t been enough written submissions to warrant the hearing being held there. A convenient excuse when many of the people living on the land around the proposed site come from a culture that has been oral rather than literate and who don’t have ready access to a computer. Once the shelter had been moved to where most people were congregating the speakers began. 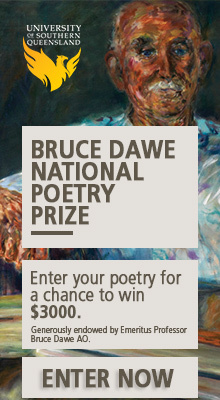 Dianne Stokes, a traditional owner from the Muckaty Land Trust, spoke, surrounded by her countrymen. 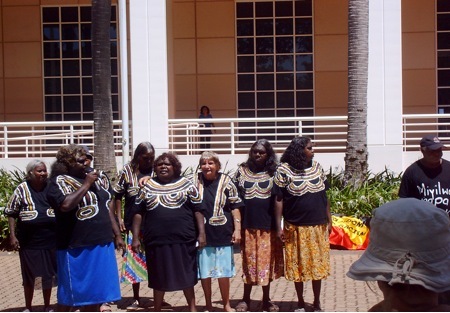 The women in black t-shirts with ceremonial designs painted around the shoulder area. The men also in black t-shirts, the names of various animals written in language down the front. The men are quiet, shy, the women animated and angry. Dianne was a strong passionate speaker, her love of land and despair of what’s going on rang out as she spoke. Many of the protestors, including traditional owners from the Muckaty Land Trust, had been to a protest at the Northern Land Council (NLC) prior to arriving at Parliament house and Dianne continued on this theme. Much of the mainstream media has focused on the fact the Ngapa people, as traditional owners of Muckaty Station, support the waste dump being located on their land. Dianne soon put that myth to rest, outlining the fact that the NLC had not consulted everyone who was part of the Muckaty Land Trust, many who are in fact not Ngapa people. (Dianne is from the Yapa Yapa Clan.) No-one sat down with everyone from the Land Trust to ascertain where the boundaries lay for tribal custodianship, and there is some dispute as to whether the Ngapa people are custodians of all the land earmarked for the waste dump. And many Ngapa people don’t want the waste dump either. It seems the NLC have failed to represent their constituents, representing the almighty dollar instead, and those people who support their stance. Rebecca Bear-Wingfield from the Arabunna-Kokatha nation, who was involved in the anti-dump movement that defeated the SA government’s plan for a waste dump, spoke eloquently of their battle and the need to persevere. Scott Ludlum, a Senator for the Greens and strong voice against the waste dump proposal in Parliament, elaborated on the economic disparity in Australia that leads to a situation where some Indigenous people will say yes to a nuclear waste dump for twelve million dollars if it means jobs, education and health, a decision no white person will ever have to make. Natalie Wasley from No Waste Alliance, who’d travelled up to Darwin with the traditional owners from Muckaty, spoke of the outrageousness that the senate inquiry wasn’t being held in Tennant Creek and the need to keep on working, keep on fighting against the dump. Other people spoke too, but these give a good summation of the breadth of people there and some of the key issues around the proposed waste dump at Muckaty Station. Suffice to say the Federal Labor Government, with a sleight of hand, repealed the Howard government’s Radioactive Waste Management Act, then copied slabs of Howard’s legislation into its own act. Thus proving the axiom that no matter who you vote for, the government always gets in. There is no doubt the battle against the waste dump will be long and hard, but with recent alliances between Indigenous people and other activists (Jabiluka, SA Anti-Waste Dump, anti-woodchipping around Eden and Goolangook, etc) things are looking good. Thanks for this on-the-spot report on the rally and its speakers, Rohan.And for highlighting the lack of consultation with all of the Indigenous clans in the Muckaty Lands Trust. Lets hope the mainstream media will follow your lead. thanks rohan too. good to have voices out there in the top of the territory and down here as well. hope the people inside listen as well as you did! No worries people, this is one fight we have to win! Thanks for that clarifiction Nat, and sorry for the misinformation, my only excuse is that I my 2.5 year old was running around trying to eat green ants and generally keeping me on my toes so I was only listening with half an ear. Yes good to hear about the solidarity actions.